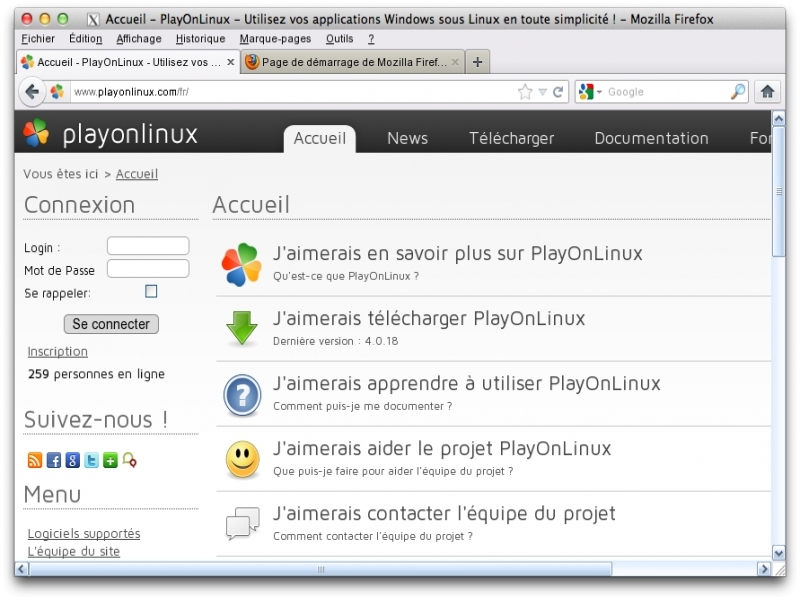 Mozilla Firefox - Supported software - PlayOnMac - Run your Windows applications on Mac easily! Mozilla Firefox is a web browser. You may need Mozilla Firefox if you want to test a website compatibility, you should not use it to navigate. Mozilla Firefox est un navigateur internet. Vous pouvez en avoir besoin pour tester la compatibilité d'un site web. Nous vous déconseillons de naviguer avec. Il permet également d'installer (de manière optionnelle) Flash Player et Shockwave Player. POL_SetupWindow_presentation "$TITLE" "Mozilla" "http://www.mozilla.com" "SuperPlumus" "$PREFIX"
POL_SetupWindow_menu "$(eval_gettext 'Which language version would you like to install?')" "$TITLE" "Afrikaans~Albanian~Arabic~Asturian~Basque~Belarusian~Bengali (Bangladesh)~Bengali (India)~Breton~Bulgarian~Catalan~Chinese (Simplified)~Chinese (Traditional)~Croatian~Czech~Danish~Dutch~English (British)~English (South African)~English (US)~Esperanto~Estonian~Finnish~French~Frisian~Gaelic (Scotland)~Galician~German~Greek~Gujarati~Hebrew~Hindi (India)~Hungarian~Indonesian~Icelandic~Irish (Ireland)~Italian~Japanese~Kannada~Korean~Latvian~Lithuanian~Macedonian~Malayalam~Marathi~Norwegian (Bokmål)~Norwegian (Nynorsk)~Persian~Polish~Portuguese (Brazilian)~Portuguese (Portugal)~Punjabi~Romanian~Romansh~Russian~Sinhala~Slovak~Slovenian~Spanish (Argentina)~Spanish (Chile)~Spanish (Mexico)~Spanish (Spain)~Swedish~Telugu~Thai~Turkish~Ukrainian~Vietnamese~Welsh" "~"
POL_SetupWindow_checkbox_list "$(eval_gettext 'Check which components do you want to install additionally:')" "$TITLE" "$AVAILABLE_PLUGINS" "~"
#echo "pref("dom.ipc.plugins.enabled", false);" > "$WINEPREFIX/drive_c/$PROGRAMFILES/Mozilla Firefox/defaults/pref/firefox.js"
- Set Windows version to win7 in Setup (Firefox refuses to install in winxp). - Set Windows version to winxp in run (https://bugs.winehq.org/show_bug.cgi?id=42388). -[ -z "$POL_SELECTED_FILE" ] && POL_SetupWindow_InstallMethod "LOCAL,DOWNLOAD"
-    POL_SetupWindow_menu "$(eval_gettext 'Which language version would you like to install?')" "$TITLE" "Afrikaans~Albanian~Arabic~Asturian~Basque~Belarusian~Bengali (Bangladesh)~Bengali (India)~Breton~Bulgarian~Catalan~Chinese (Simplified)~Chinese (Traditional)~Croatian~Czech~Danish~Dutch~English (British)~English (South African)~English (US)~Esperanto~Estonian~Finnish~French~Frisian~Gaelic (Scotland)~Galician~German~Greek~Gujarati~Hebrew~Hindi (India)~Hungarian~Indonesian~Icelandic~Irish (Ireland)~Italian~Japanese~Kannada~Korean~Latvian~Lithuanian~Macedonian~Malayalam~Marathi~Norwegian (Bokmål)~Norwegian (Nynorsk)~Persian~Polish~Portuguese (Brazilian)~Portuguese (Portugal)~Punjabi~Romanian~Romansh~Russian~Sinhala~Slovak~Slovenian~Spanish (Argentina)~Spanish (Chile)~Spanish (Mexico)~Spanish (Spain)~Swedish~Telugu~Thai~Turkish~Ukrainian~Vietnamese~Welsh" "~"
-    FIREFOX_FILE="$(sed -n 's#.*Firefox%20Setup%20[0-9. ]*.exe">\(Firefox Setup [0-9.]*.exe\). *#\1#p' FirefoxIndex.html|tail -n1)"
-    [ "$FIREFOX_FILE" = "" ] && POL_Debug_Fatal "Firefox version : detection failure. bug"
+        POL_SetupWindow_menu "$(eval_gettext 'Which language version would you like to install?')" "$TITLE" "Afrikaans~Albanian~Arabic~Asturian~Basque~Belarusian~Bengali (Bangladesh)~Bengali (India)~Breton~Bulgarian~Catalan~Chinese (Simplified)~Chinese (Traditional)~Croatian~Czech~Danish~Dutch~English (British)~English (South African)~English (US)~Esperanto~Estonian~Finnish~French~Frisian~Gaelic (Scotland)~Galician~German~Greek~Gujarati~Hebrew~Hindi (India)~Hungarian~Indonesian~Icelandic~Irish (Ireland)~Italian~Japanese~Kannada~Korean~Latvian~Lithuanian~Macedonian~Malayalam~Marathi~Norwegian (Bokmål)~Norwegian (Nynorsk)~Persian~Polish~Portuguese (Brazilian)~Portuguese (Portugal)~Punjabi~Romanian~Romansh~Russian~Sinhala~Slovak~Slovenian~Spanish (Argentina)~Spanish (Chile)~Spanish (Mexico)~Spanish (Spain)~Swedish~Telugu~Thai~Turkish~Ukrainian~Vietnamese~Welsh" "~"
-    FIREFOX_FILE="$(sed -n 's#.*Firefox%20Setup%20[0-9. ]*.exe">\(Firefox Setup [0-9.]*.exe\). *#\1#p' FirefoxIndex.html)"
+    FIREFOX_FILE="$(sed -n 's#.*Firefox%20Setup%20[0-9. ]*.exe">\(Firefox Setup [0-9.]*.exe\). *#\1#p' FirefoxIndex.html|tail -n1)"
[ "$FIREFOX_FILE" = "" ] && POL_Debug_Fatal "Firefox version : detection failure. bug"
[ -z "$POL_SELECTED_FILE" ] && POL_SetupWindow_InstallMethod "LOCAL,DOWNLOAD"
FIREFOX_FILE="$(sed -n 's#.*Firefox%20Setup%20[0-9. ]*.exe">\(Firefox Setup [0-9.]*.exe\). *#\1#p' FirefoxIndex.html|tail -n1)"
Update download mirror (It was stuck on version 31.0). 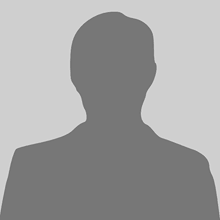 FIREFOX_FILE="$(sed -n 's#.*Firefox%20Setup%20[0-9. ]*.exe">\(Firefox Setup [0-9.]*.exe\). *#\1#p' FirefoxIndex.html)"
Current mirror is stuck at Firefox 31.0. I get md5sum error when downloading additional package for flash player at end of installation, will this update fix that? Otherwise works great!